At the following site www.effectivepapers.com each student will get instant American History essay writing help on any topic. There is a palm fringed Whitehaven beach on the island of Barbados that boasts temperatures from 75 F to 85 F (24 C to 30 C) and refreshing Trade Winds 7 - 8 miles per hour. 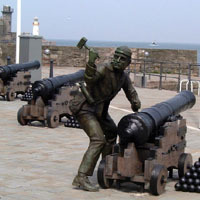 The island's history had great links with Cumbria. 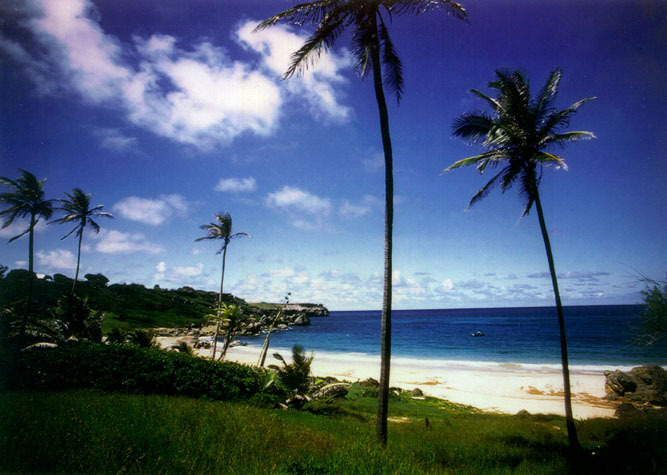 English explorer John Powell discovered the then-uninhabited island of Barbados in 1625, and it was colonized by English settlers two years later. Britain's most prized possessions. No doubt some of that sugar and rum sailed home to Whitehaven! Hence the Rum Tongue and Sugar Tongue piers in the old harbour. John Gale an Irish Non-Conformist, came to Whitehaven in 1663 and became one of the town's most influential citizens. One of his grandsons, George Gale, visited Virginia, where he met and married Mildred Warner Washington, a widow with three young children. The family returned with him to Whitehaven. The two sons Augustine and John became pupils at Appleby Grammar School. Tragically Midred died in childbirth in January 1701, only a year after her marriage to Gorge Gale. She was buried in St Nicholas Churchyard in the centre of Whitehaven. Her gravestone has not survived but a commemorative plaque can be seen in the tower of the church, the only part left standing after a fire in 1971. After her death a dispute over her will resulted in her children being taken back to America in 1704. This move could well have affected the course of history as in 1732 Augustine became the father of George Washington. *Number 151/152 Queen Street may have been erected for William Gale, a merchant who had ships trading with the then booming American tobacco growing colonies. The house is one of the earliest large house in town to survive with its ground floor accommodation intact, it has latterly been owned by the Bonnar family. The impressive house was occupied by William Gale until his death in July 1774. The back courtyard was originally the setting for the Gale's own warehouse and a counting house for counting all the money he must have made in meeting the new craving for tobacco. These buildings were restored by the Bonnar family. Thought to have been built in 1733 for its time and location, the house was a grand residence. It remains Whitehaven's best preserved example of a Georgian house still with its original features intact, including floor to ceiling wood panelling. Inside the renovation work will ensure the magnificent original wood panelling and ornate carved plaster ceiling features are well preserved for the future. The Gale Mansion, a Grade II star listed building, has a blue plaque outside, outlining its American connections for the local tourist trail, The Quest. As is well know there was also a historic link between the Gale family and George Washington, the first President of the USA. William was the brother of George Gale who married Mildred Warner, Mildred had previously been married to Lawrence Washington and a son by this marriage (Augustine) was to become the father of George Washington. It is thought the young Augustine and his brother and sister may have played at the Gale Mansion, while visiting as children. The brothers, following the death of their mother, were sent to Appleby Grammar School but following pressure from the Washington family in Virginia they were subsequently returned to America. Mrs Nellie Bonnar and her three daughters, Fiona, Anne-Marie and Christine are paying for the important renovation works. The house was passed down to Mrs Bonnar by her family, who had bought it in the 70s. The house was passed down to Mrs Bonnar by her family, who had bought it in the 70s. Commenting on the reroofing and other works, Mrs Bonnar said: *After 300 years it is no surprise the house could do with a new roof! * Mrs Philomena O'Hare adds:"151 and 152 are not linked. 152 came later though it is Georgian. 151 is on a map of 1725 though the outbuildings were not build by then and the garden seems to have stretched to Irish Street. The outbuilding in the back yard were from left to right; A stable for 2 horses with drains and hay racks, A coach house for the coach, A coachmans cottage. Above all of this was a loft with a door through which hay would have been hauled up and with access to the horses hay racks. There is a barrel vaulted cellar, presumably for storage of the rum etc which Gale imported. There is a spiral staircase from the kitchen to the attic where the bell for the maid/cook was still in place when I lived there. The house has a double roof. The house belonged to my parents Frank and Julia OHare from 1949 till it was bought by Nellie Bonnars aunt at a date I am unsure of." A surviving 5th generation relative of John Gale, Alton Rogers, was based in Texas. Ben Franklin seems to have enjoyed more than his fair share of abilities. He was a statesman who helped guide the infant United States. He spent some years in Britain before the American War of Independence. In 1772 he visited Whitehaven to see William Brownrigg, the leading scientist in the area. He descended one of the local coal mines and studied the fossils found underground. On 6 July 1997 the US Navy commemorates the 250th anniversary of the birth of John Paul Jones, who helped establish the traditions of courage and professionalism that the United States Navy proudly maintains today. In life and battle he exemplified a hero's determination and upheld America's ideals of liberty and independence from tyranny. The man whom Thomas Jefferson later described as "the principal hope of America's future efforts on the ocean" was born on 6 July 1747 in the gardener's cottage of the Arbigland Estate, Kirkbean, Scotland. At the age of 13 John Paul as he was then called, was apprenticed to John Younger a Whitehaven tobacco merchant to learn the art of seamanship. His first voyage was aboard Younger's 170 tonn brig @Friendship@ which sailed to Barbadoes and Virginia in 1761. During the third of his voyages to America in 1763 John Younger became bankrupt and John Paul's apprenticeship came to an abrupt end. However impressed by the youth's abilities Younger obtained for him the post of third mate aboard the slave ship "King George". Later Jones became commander of another slave ship the "Two Friends" of Kingston, Jamaica but Jones hated "this abominable trade" and by 1768 he returned from Kingston as a seaman aboard the 60 ton brig"John", During the voyage, the captain and mate died of yellow fever and the 21 year old Jones took command. On his reaching Kircudbright his captaincy was confirmed by the owners. On the Caribbean island of Tobago, where his ship Betsy ended her outward voyage, Jones decided to invest money in return cargo rather than pay his crew for their shore leave. One sailor, known as "the ringleader," attempted to go ashore without leave. Jones drew his sword on the man to enforce his orders, but the man set on his captain with a bludgeon. In response to the attack Jones ran him through with his sword. Jones immediately went ashore to give himself up, but the death of the ringleader had so stirred up local sentiment that John Paul's friends prevailed upon him to escape to Virginia at once. In December 1775 Jones received his lieutenant's commission from the Continental Congress for its navy. On 3 December 1775, as first lieutenant of Alfred, he hoisted the Grand Union flag for the first time on a Continental warship. The flag's Union Jack in the upper left canton and thirteen red and white stripes represented a united resistance to tyranny but loyalty to the English King. In February 1776 John Paul Jones participated in the attack on Nassau, New Providence Island. Jones was appointed to command Providence on 10 May 1776; his commission as Captain in the Continental Navy was dated 8 August 1776. The 12- gun sloop departed for the Delaware Capes on 21 August. Within a week she had captured the whaling brigantine Britannia. Near Bermuda, she fell in with a convoy escorted by the 28-gun frigate Solebay. In a thrilling chase lasting ten hours, Jones saved Providence from the larger warship by an act of superior seamanship. By 22 September he had captured three British merchant vessels. While anchored he burnt an English fishing schooner, sank another, and made prize of a third. Jones would later declare that his best crew had been on board Providence; he had received sound financial rewards from the prizes, making this venture the most enjoyable of his career. In November 1777, John Paul Jones sailed for France in Ranger, carrying word of Burgoyne's surrender at Saratoga. Admiral La Motte-Picquet returned Jones' salute at Quiberon Bay on 14 February 1778, the first time the Stars and Stripes were recognized by a foreign power. Ranger later captured the British sloop of war Drake off the coast of Ireland on 24 April and pillaged the British coast. The French king loaned Jones the Bonhomme Richard, which Jones had renamed after Poor Richard's Almanac, in honor of Benjamin Franklin. On 14 August 1779, in command of four other ships and two French privateers, Jones continued his raids on English shipping. In his most famous engagement, 23 September 1779, Jones engaged the British frigate Serapis off Flamborough Head, Yorkshire. Serapis was a superior ship compared to Richard. She was faster, more nimble and carried a far greater number of eighteen pounders. The two ships fired simultaneously. At the first or second salvo, two of Jones' eighteen pounders burst, killing many gunners and ruining the entire battery as well as blowing up the deck above. After exchanging two or three broadsides, and attempting to rake the Serapis' bow and stern, the commodore estimated that he must board and grapple, a gun-to-gun duel seeming futile. Serapis' Captain Pearson repulsed the boarders, and attempted to cross Richard's bow to rake her. During this stage of the bloody and desperate battle, Pearson, seeing the shambles on board Bonhomme Richard, asked if the American ship had struck. Jones' immortal reply, "I have not yet begun to fight," served as a rallying cry to the crew. The two ships grappled and Jones relied on his marines to clear the enemy's deck of men. To Jones' disgust, Alliance, under the Frenchman Pierre Landais, fired three broadsides into Richard. Landais later stated that he wanted to help Serapis sink Richard, then capture the British frigate. Even though his ship had begun to sink, Jones determined he would not strike his colors. He used his remaining guns to weaken Serapis' main mast. It began to tremble, Pearson lost his nerve and decided to strike his colors. When the battered Bonhomme Richard sank on 25 September, Jones was forced to transfer to Serapis. For his victory, Congress passed a resolution thanking Jones, and Louis XVI presented him with a sword. One of Jones' midshipman on board the Bonhomme Richard was Beaumont Groube. He acquired fame as the "Lieutenant Grub" of chapbooks (comics), supposedly shot by Jones for striking the colors during battle, an action which would have signified the Richard's surrender. After the Revolutionary War, Commodore John Paul Jones was active in negotiating prize money claims in Paris. In 1788 he entered the service of the Empress Catherine the Great of Russia as a rear admiral. He hoped that command of a battle fleet in Russia would qualify him for higher command if and when the United States built a permanent Navy. Although he successfully commanded the Black Sea Squadron in the Dnieper River, court intrigues forced Jones to leave Russia. John Paul Jones returned to Paris in 1790 where he died 18 July 1792. Most general histories of the Navy focus on his seamanship and courage when in danger but not on his character. These honorable portrayals of Jones contrast with images of piracy presented by the British. Rudyard Kipling, for example, refers to the "exploits" of Jones, "an American Pirate." Sir Winston Churchill calls him a "privateer" and even Theodore Roosevelt mentions him as a "daring corsair." Jones, of course, neither held a privateering commission nor was engaged in piracy, the realization of which might be what prompted someone on one occasion to cross out the British Library catalogue entry for John Paul Jones as "the Pirate," and substitute "Admiral in the Russian Navy." In modern terms John Paul Jones indulged in questionable behavior, since his popularity with women led him to having many lovers. Furthermore, he failed to be a good team player, spurning the naval efforts of others as inadequate compared with his own brilliant accomplishments. John Paul Jones not only had a brilliant naval career, he also wrote in detail throughout his life to promote professional naval standards, training and protocol. For generations, midshipmen have been required to memorize his dicta outlining the appropriate qualifications and duties of a naval officer. "As you know that the Credit of the Service depends not only on dealing fairly with the men Employed in it, but on their belief that they are and will be fairly dealt with." --John Paul Jones to Joseph Hewes, 30 October 1777. This advice is rather in contrast to his withholding of the crew's pay during a merchant cruise to Barbados. In that instance Jones' behavior sparked a mutiny and led to his flight to Virginia. During the nineteenth century, John Paul Jones was idolized by popular writers and extravagantly praised as a man of action. He has been the subject of at least thirty biographies and more than forty chapbooks. Alexander Slidell Mackenzie, James Fenimore Cooper, Alexandre Dumas, Herman Melville and Sarah Orne Jewett, for example, included Jones' fascinating life in their subjects of study. The site of the burial of John Paul Jones was rediscovered by Ambassador Horace Porter in 1905, and American warships brought Jones' body to America to be interred in the Chapel of the Navy Academy. Following ceremonies held in Dahlgren Hall on 24 April 1906, the casket of John Paul Jones was carried into Bancroft Hall and placed under the grand staircase leading to Memorial Hall. He remained for nearly thirteen years until additional funds were appropriated for the completion of the crypt in the Chapel. "The future naval officers, who live within these walls, will find in the career of the man whose life we this day celebrate, not merely a subject for admiration and respect, but an object lesson to be taken into their innermost hearts. . . . Every officer . . . should feel in each fiber of his being an eager desire to emulate the energy, the professional capacity, the indomitable determination and dauntless scorn of death which marked John Paul Jones above all his fellows." - -President Theodore Roosevelt't Address to The U.S. Naval Academy, Annapolis, April 24, 1906. His casket was finally re-interred in the crypt of the U.S. Naval Academy Chapel on 26 January 1913. During the period of John Paul Jones's stay in Bancroft Hall the following ditty became popular and was sung to a tune of the era titled Everyone Works but Father. Everyone works but John Paul Jones! On a permanent jag, they say. Everybody works in 'Crabtown' But John Paul Jones. The cornerstone for the current "cathedral of the Navy" was laid by Admiral George Dewey in June 1904, and the Chapel was dedicated in May 1908. It was originally designed in the shape of a Greek cross with equal transepts. The dome was originally decorated with terra cotta military emblems and devices. These were removed in 1928 because of weather damage and expense of maintenance. A nave was added to the Chapel in 1939-40, making it a Latin cross and increasing the seating to 2,500. Although architect Ernest Flagg considered the crypt of the Chapel as a potential tomb for naval heroes, particularly John Paul Jones, funds were not provided for its completion for this purpose until 1912. Following the recent news that a replica of the ship, Ranger, may be built in Whitehaven, plans are currently in place in Portsmouth, New Hampshire, USA, to construct a replica. Portsmouth is the place where the ship was originally constructed and launched. In 2001 AMERICAN divers have been warned off the deep sea wreck site of Jones' warship the Bonhomme Richard. The vessel, sunk off the Yorkshire coast, near Filey, was the first warship of the newly independent United States. Now, US divers are keen to search out the ship's treasures but after a tip-off to Government officials from the Department of Culture, Media and Sport last week that an American diving team was preparing to raise precious artefacts from the wreck, believed to be that of the 40-gun Bonhomme Richard, action was taken. Arts minister Lady Blackstone issued an emergency order barring an approach to the wreck. She said it was understood that the wreck had caught the eye of salvors and there were concerns it might have been stripped within days. Before the start of the American War of Independence some 1500 one foot square flag stones were needed to pave the Piazza at Mount Vernon, the home of George Washington. They were ordered from George Rumney, a Whitehaven merchant ship owner as Whitehaven stone had been specified. The flag-stones were delivered in 1786. In 1914 the stones were becoming worn and replacements were ordered by McKays Quarry at St Bees, from which the original red sandstone flags had come over a century earlier. Such dressed stone proved a useful cargo, doubling up as ballast. Around 1650 shipbuilding had started in earnest at Whitehaven. The building was in response to the needs of the coal trade. Possibly the most famous builder was Daniel Brocklebank (1742-1801) The founder of the world's oldest registered shipping line. At the age of 28 Daniel crossed the Atlantic and established a ship building yard at Sheepscutt, Maine. Becoming acutely aware of the increasing hostility between the British Crown and the American colonists, he decided to abandon this venture and in 1775 returned to Whitehaven. Here in Whitehaven he resumed his work and in 1782 set up a yard at North Shore. Here he built some 27 vessels before his death, the business being continued by his descendants. In 1819 Brocklebanks established a shipping concern at Liverpool. This company was later acquired by the Cunard Line, whose claim to be the oldest registered shipping line is derived from the Whitehaven connection. It was a seaman apprentice with Brocklebanks, James Anderson, who had involvement in another important American link. The first internet link in a sense! Anderson was promoted rapidly and took command of the Great Eastern which had been commissioned to take the transatlantic cable under the Atlantic in 1866. As a reward Queen Victoria bestowed a knighthood on Anderson. OTHER WHITEHAVEN LINKS The tall ship, the Vicar of Bray built at Whitehaven by Robert Hardy in 1841 plied the Atlantic for over thirty years. She is the only surviving vessel that took miners out to the goldfields in the Californian gold rush of 1849. In 1870 she was damaged in the stormy Southern oceans and now languishes as a hulk in the Falkland Islands. The tough collier ships built to carry coal to Dublin were tough enough for the demanding trans-Atlantic voyages as the value of tobacco made the voyages worth the risks. The ships carried outward bound textiles and plantation shoes and leather goods. Also pots and pans and all the necessary goods to help supply the early US colonies. Average Atlantic crossing times were around 10 weeks. Vessels were typically 190 tonners. To help feed the crews the top decks often featured hens, pigs and geese. The tobacco bought out in the new colonies were shipped home in standard hogheads. In a bizarre aspect of Whitehaven's thriving tobacco trade were the Bransty "pipes" chimneys on the cliff tops from which seized contraband tobacco was burned. 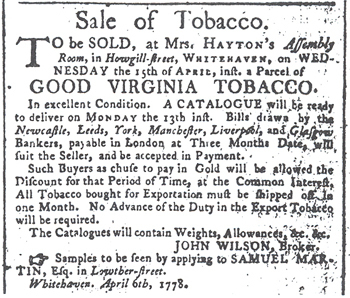 For more detail please see Whitehaven and the Tobacco Trade by Nancy Eaglesham; available via http://www.abebooks.co.uk. The other Whitehaven in Maryland USA was named after its Cumbrian namesake. The Village of Whitehaven makes a quiet home base for a visit to the Eastern Shore of Chesapeake Bay. An hour away, visit the Bright Lights of Ocean City, Maryland or the unspoiled beaches of Assateague Island. Bird Watch at the Blackwater Wildlife Refuge and Assateague Wildlife Refuge or tour the Historic Sites of this old and lovely land. The level ground and quiet roads are ideal for Biking. Fine Public Golf Courses abound. ROBERT SALMON The Father of American School of Marine Artists was born in Whitehaven in 1775 and specialised in paintings of ships. In 1828 he sailed to America and was in Boston 14 years.